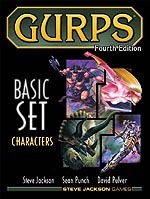 What GenCon would be complete without role-playing games like GURPS Fourth Edition? Okay, I admit that was a trick question. Where else can you find thousands of gamers frantically rolling dice and telling great stories? This year, we are rolling out the red carpet for GURPS fans. First, to celebrate the trio of ENnie nominations heaped upon GURPS Horror, we will have long-time GURPS freelancer Kenneth Hite at our booth for two signings on Friday and Saturday from 4:30 p.m. to 5:30 p.m. Ken has worked on a number of print and digital GURPS-related supplements, including GURPS Infinite Worlds and GURPS Infinite Worlds: Worlds of Horror. And second, Pyramid editor Steven Marsh will host two GURPS Meet-and-Greets to talk about what's new and upcoming for the line, and to highlight the ENnie-nominated GURPS Social Engineering, penned by William Stoddard. Steven will also explain the basics of the system for anyone who wants to learn, and offer suggestions for which supplements can enhance your campaign. Drop by the booth from 2:30 p.m. to 4:30 p.m. on Saturday and 10:00 a.m. to noon on Sunday. We hope to see you at GenCon!